As a mom to two children, I am no stranger to the delivery room. I mean what could be more magical than the birth of your own children? Recently I learned there is one thing almost as magical, to witness the birth of someone else. My sister graciously invited me into the room when my sweet little niece Adeline was delivered. If I were more eloquent with words I would describe my experience from start to finish, but I am not sure I have the right words to truly give it justice. While I did manage to capture incredible images I've decided not to share them here. 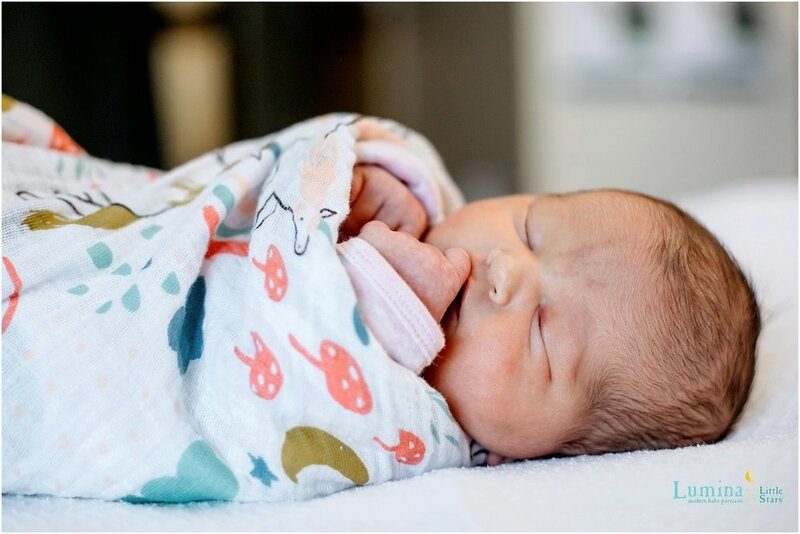 Roughly 36 hours after Miss Adeline was born I returned to the hospital to capture her during the first few days of her life. I find newborn sessions at the hospital to be magical. The lack of sleep has yet to set in and parents are still teetering in a state of euphoria and instant love. Welcome Sweet Adeline! What is a fresh 48 Photographer? For those of you wondering, fresh 48 photographers will visit you in the hospital shortly after your baby arrives to document this miraculous occasion. You don't need to use the photographers you the hospitals have on staff. Learn more! Want to get your hands on that amazing unicorn swaddle?? You can find it over at Spearmint Baby.